The new owners, Craig, Elle and Bryan. They all happen to be members of the local Bell, Clarence and Shipley Rural Fire Brigades. Something special at Bell, Blue Mountains. Three very unique experiences rolled into one package. Monkey Creek Cafe, Hatters Hideout or Hat Cave and Lyres Lodge, Loft Cottage settled in 30 acres at Monkey Creek. Monkey Creek Cafe, offers a unique experience and catering to your requirements. Receptions for weddings, birthdays, corporate functions or private functions. The roof design is a representation of the curved roof at Hat Cave. The views are astonishing, where can you dine in a non built up area these days, with such spectacular Blue Mountain Valley scenery, catered to your requirements and one place that will be remembered by your guests. Hatters Hideout and Hat Cave, is a secluded area of the Blue Mts overlooking the World Heritage Area with Australia's dinosauric era's, Wollemi Pine. Hatters Hide Out and Hat Cave is right in Mountainous country, with varied terrain and fauna and flora. Rainforest cool temperatures, with bonsai trees grown wildly, to patchy heath, opening to woodland and spectacular views of the valley. Escarpments surround you as you have exclusive use of this bushland setting. 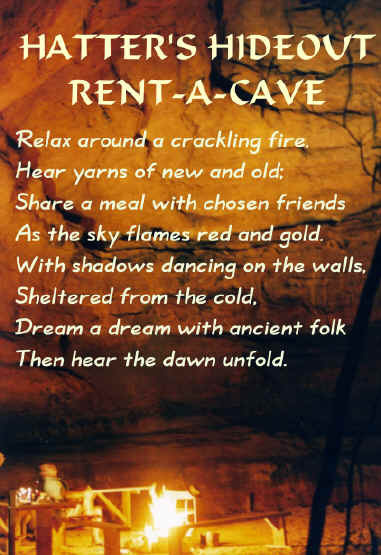 Hat Cave is a sandstone cathedral, eroded and shaped into a wondrous idealic setting. An ideal bushland retreat with minimal impact on the environment. Hat Cave is a musician's delight as the natural acoustics here are truly out of this world. The way Monkey Creek and Hatters Cave has been created is special. Easy access walking track only 500 meters or 10 minute walk, with seats installed, to bring some comforts from home, while experiencing this wondrous bushland setting. 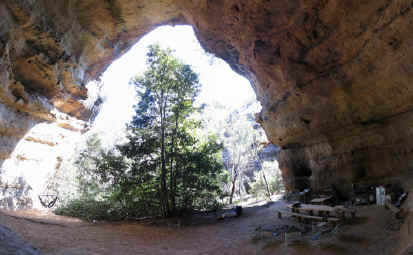 The cave's arch is 25 meters high and is protected by its north west position surrounded by coach-wood trees. The 30 metre carved rock columns, are one of the unique features of the Blue Mts. The pagodas have a small knob or beehive look on top of the rocks. A Bush Walk and Talk to the Cave to keep you well informed of what you are about to experience. A campfire is a must with 20kgs of wood available. There is also gas BBQs, ice boxes, tables and chairs, solar powered lights, candles, taps supplying rainwater for cooking and washing up, a kitchen sink, basic cooking utensils and yes, even a composting toilet and of course a first aid kit, is all here for your use. Plus you can experience nature at its finest as you sleep in the cave - with camping equipment supplied. Suggested for non winter months, as the temperature can drop rather low during winter. Available for 20 people with options and exclusive use of all 3 facilities. For the Non Campers or those wanting the luxuries while in this lovely bushland, this is your 3rd option, which sleeps 8 adults. An Australian style oasis has been created in the heart of Monkey Creek offering a beautifully presented 3 bedroom and Loft, Mountain Lodge. 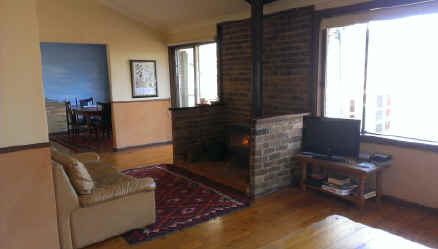 Relax, enjoy the surrounds of Wollangambe Wilderness and Wollemi World Heritage Area from inside the Lodge. Huge spaces, 3 king sized or twin bedrooms, a loft with 2 beds and 2 bathrooms, 2 lounge rooms, kitchen, double gas cooker and even a dishwasher and a huge 8 seater table. 4 star luxury rating, with doonas and electric blankets all supplied. So book one and get an all inclusive package and forget the rest of the world exists. Definitely a big tick off the bucket list or just a fantastic spot to celebrate, hold a function or have a group getaway, in pristine bushland settings, all to yourself, with amazing views, birdlife, Mountain Ash Trees and Lyrebird country. Prices range from $ 445 to $1200 - please check the site for further details. Suitable for groups of up to 20 people. For availability and bookings please contact Mark on 0488 552777.